Essentially, it talks about devoted owners - like us - but specifically, empty-nesters..."who have 'transferred their love' to their dogs, creating a parent/child-like relationship." Hmmm...I hate to tell the Alcone Marketing Group, which did the study, but... we all feel that way. Don't we? 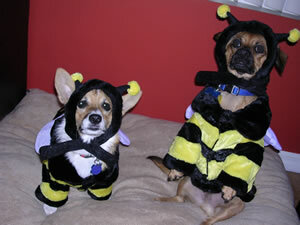 I mean, we even dress them up...as evidenced by the picture here, today. Found this little ditty all on my own. TShirt D'art Blog...with funny, funny pics of hungry pets (dogs and cats) singing for their supper. I wish it had audio. Check it out...here. Videos coming in... stay tuned! Send in questions for Dr. Larry!